ha-Navi he-Hadash: Tel Aviv visar solidaritet med Barcelona. ISIS. Tel Aviv visar solidaritet med Barcelona. ISIS. Tel Aviv municipal building lit with the colors of the Spanish flag following Barcelona van attack. 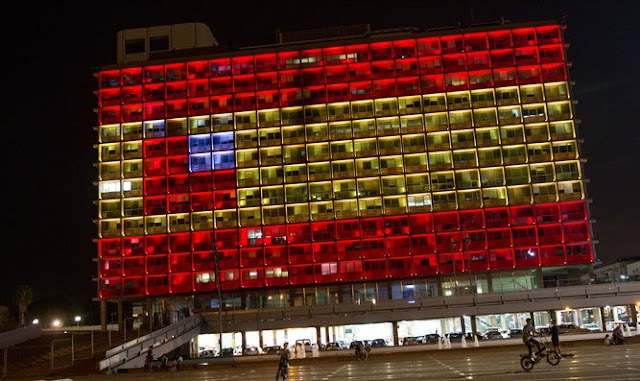 The city of Tel Aviv on Thursday night showed solidarity with Spain following the terrorist attack in Barcelona, lighting the municipality’s building, located at Rabin Square, with the colors of the Spanish flag. The building has in the past been illuminated with the flags of other countries following previous terrorist attacks, most recently in May, when the building was lit with the colors of the Egyptian flag following a shooting attack against Coptic Christians in Cairo. At least 13 people were killed and 100 injured in Thursday’s attack at the busy Las Ramblas avenue. Authorities believe the death toll could rise. Police have arrested two suspects in connection with the attack, but have not yet caught the driver of the vehicle, who is believed to have fled on foot. The Islamic State (ISIS) has claimed responsibility for the Barcelona attack, through its Amaq news agency. Here in Barcelona, there was hope that the sting of Muslim terror would leave out of this deadly game. I will admit that with the rise in Islamic terror across Europe, I started to question my own hopes for this oasis of quiet. The thousands of tourists enjoying themselves in La Rambla drew out the Muslim extremists. 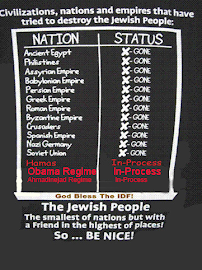 The world is now mourning the murder of innocents, but it’s really time for the West to wake up. Just like in Israel, it is difficult to stop this kind of terrorism. Rhetoric won’t stop the bloodthirsty terrorists from striking in Germany, the UK, Spain, or Israel. It’s time for Europe’s leaders to stop babbling and to come together and make a united effort against those who want to violently impose Islam on the world. Weakness and rhetoric, the kind we still see emanating from European capitals, will only bring the free world to catastrophe. To win this war, security forces must ignore the background noise, ignore the bleeding hearts, and to stop citing ‘violations of personal rights’ when the safety of innocent people is at stake, and to ignore those who scream bloody murder every time a Muslim is given a security check at an airport. Time to let the security establishment secure us. Du - har du hört om den rasande totala attacken från EU mot ISIS efter alla mord de har erkänt mot EU-mål? Sveriges rasande attacker mot ISIS från Libyen till Sinai? Är EUs ytterst väl avbetalda ledare mutade eller samarbetar de frivilligt? Amnesty kritiserar de palestinska diktatorerna. Är du medveten? Politikerna är det inte. Ovanligt politiskt inkorrekt i Expressen. Tel Aviv visar solidaritet med Barcelona. Tusen Och en Natt som Ehud Barak. Det mest europeiska landet i EU. Två nya ambassader till Israel. Vad är en "palestinier" ? Orban och jag har precis samma åsikt!